Cyber security threats have been expanding in both frequency and types of breaches over the years. Companies have correspondingly responded with measures to protect their information and their corporate systems. Threats exist for building operations too, and like corporate systems need be taken more seriously due to the ramifications that can be extensive around data loss, human safety, competitiveness and reputation. 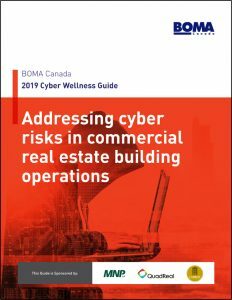 To create more awareness of these risks and help you understand how you can be prepared at the building level before any incident occurs, we have created this wellness guide. Cybersecurity is often a complex and technical subject, but we have tried to tailor it to the industry’s current state of preparedness, and we have drawn on a variety of ideas and sources. This guide is primarily geared towards introducing the concept of cyber security planning for managers and operational leaders of real estate. We believe that anyone who works in or manages commercial and institutional building operations directly or indirectly, or has exposure to internet-connected systems would find it valuable.